Born out of a techniqie that is in danger of being a lost art because of its complexity - this Avedon & Colby African Panoramic Scenic will shortly become a collector's treasure. Each length and width requires its own set of art vision, plus engraver's dies – making it prohibitively expensive at the outset. The there is the question of materials, testing against the expected result – topped off with our Signature Sand Caste Brass Pony Hitch hardware. 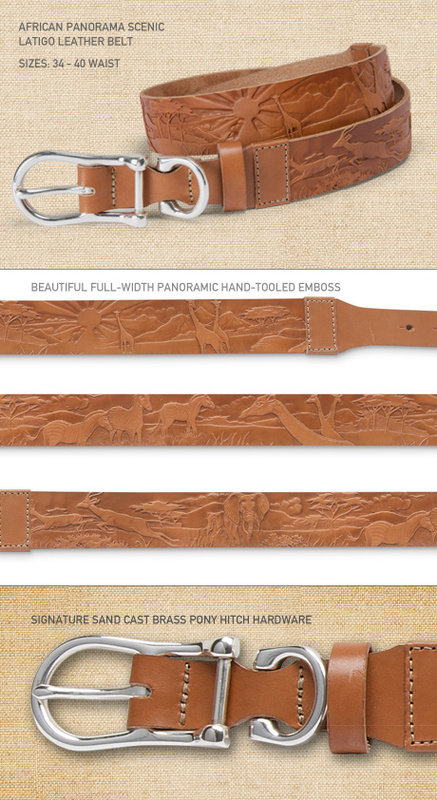 We felt this was a project worth the time and effort put into it by our amazing belt maker. We know you will agree! Latigo Leather: A combination tanned leather making it rigid but very pliable – great for use where both strength and flexibility are needed. Signature Buckle: The sand caste brass buckle is styled after an English harness hitch with an equestrian two-piece center bar and matching metal D-ring.